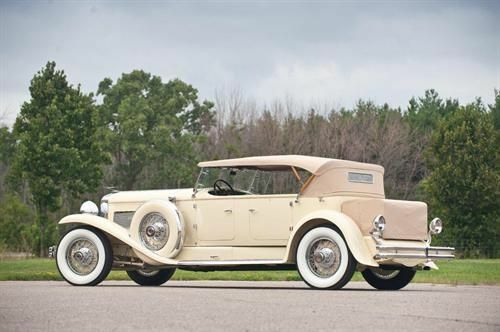 Cars from the era of the classic novel The Great Gatsby, which has a new film starring that Titanic chump, will be on display at this Hilton Head Island Motoring Festival & Concours d'Elegance later this year. One of the nation's largest and fastest-growing events is the Hilton Head Island Festival & Concours d'Elegance, commonly called the Hilton Head Concours, which happens in November every year. This year, there is a Great Gatsby theme and many of the vehicles on display will be models that could have been straight out of the Jay Gatsby collection, given their provenance and luxury. The star of that gala will likely be the 1931 Duesenberg Model J Tourster pictured above. This spectacular luxury automobile is a grand example of the ultimate in automotive opulence for the day. The latest film adaptation uses a 1929 model of this car, in fact. It is the pinnacle of the Classic Era of design and engineering for motor coaches. At a time when the average car sold for about $500 new, the 1931 Model J Tourster sold for a whopping $20,000. In today's inflated dollar, that's equivalent to $298,000. Another classic example to be displayed is a 1928 Packard 443 Roadster. While not as excessive as the Duesenberg, this Packard is an icon of the era and its interior and exterior match the description of Gatsby's car in the novel - "a rich cream color, bright with nickel.." and "Sitting down behind many layers of glass in a sort of green leather conservatory.." The Packard sports a cream paint coat and a green interior. Other vehicles that will be on display include a beautiful 1930 Locke-bodied Lincoln Sport Roadster, which is a contemporary of the Packard. There will also be a 1931 Rolls-Royce Phantom I (also called the P1) transformable sedan, which at the time was one of the most advanced automobiles in production. A 1931 Pierce-Arrow Model 42 Convertible Coupe was a favorite car for politicians and movie stars of the time. And finally a 1932 Auburn 12-160 Speedster, which may be one of the sportiest cars of the era with its streamlined looks, boattail rear and huge V12 engine (the 12 cylinders, 160 bhp). Any one of these cars would be worth going to the show, but all of them together make it a priceless event.